Events of this week should leave no doubts that the war against terrorism is Pakistan’s war as much or even more than it is the west’s. So what are we going to do about it? Even though I basically agree with Imran Khan’s assessment that terrorism cannot be defeated by bombing it, I also think that he’s oversimplifying a complex issue. If we’re going to rid Pakistan of terrorism, we’re going to have to stop oversimplifying and use a complex approach at restoring order. When Imran Khan says that the extremism that fuels terrorism is an idea that must be fought by showing that it is a failed and self-defeating idea, and that there is an alternative and superiour idea that should be chosen instead, he’s right. But terrorist groups that plan and carry out acts of violence against innocents can and must be defended against. These are two different issues, and we can’t stop terrorism unless we deal with both. Talking to militant groups sounds like an easy enough solution, and sometimes discussions and negotiations are a necessary part of a solution. But just because they’re necessary doesn’t make them sufficient. TTP leader Hakimullah Mehsud said earlier this week that he rejected the governments offer of peace talks and vows to carry out more attacks. Should our security forces sit quietly while TTP plans and carries out attacks against our citizens, hoping that some day he will agree to talk? Military force is not sufficient on its own, but neither is talking. The only way to rid the nation of the scourge of terrorism is to make a two-pronged attack. First, the security forces must be used to provide a secure environment in which extremists know that violence will not be tolerated. This must be carried out by using our skilled intelligence officers to identify militants and our police and military to prevent them from carrying out acts of violence by destroying their ability and their will to do such acts. Even Imran Khan agrees that no militant groups should be allowed to operate in Pakistan, and that the government should de-weaponise the nation and shut down all militant groups. The bizarre thing, however, is that he says we should wait until after the war on terrorism is over. Obviously, he means we should wait until the Americans leave, though I don’t understand why that would make any difference. Imran Khan says that no militant groups should be allowed to operate in Pakistan, but PTI is organizing protests against Pakistan Army in Khyber. How are militant groups going to be dismantled if not by Army? Last weekend, four intelligence officials were killed during a raid on a hideout of Lashkar-e-Jhangvi, a terrorist group that murdered dozens of innocents during terror attacks in September. Are those intelligence officials shaheeds who sacrificed their lives to protect their countrymen? 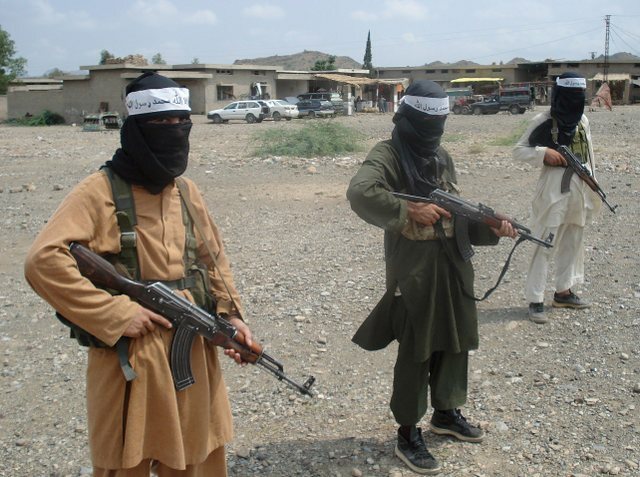 Or should the LeJ militants have been allowed to operate freely until the Americans leave? Second, our civil society must provide a vision and ideology that offers a superiour alternative to the cult of death that is militant extremism. This starts in our own homes as we talk to our friends and family. It takes place in our mosques and our schools. When we hear someone spreading a message of hate, whether it is religious, sectarian, racist or xenophobic, we must speak out against it. In order for the second part to happen – the talking, and disarming extremism with alternative ideas – the first must happen – there must be a safe space for dialogue to take place without the threat of violence. A perfect example can be seen in the murder of Salmaan Taseer. Whether you think that Mumtaz Qadri is a cold-blooded murderer or someone who was motivated by a deep love of the Prophet (PBUH), one thing is undeniable – Qadri’s violent action made it unsafe to talk. Even Imran Khan himself told NDTV that no militant groups should be allowed to function, but that it is not safe to speak openly because of the threat of terrorist groups. Cleaning up the mess of militancy and extremism that is plaguing our country is not going to be easy. I wish it was. But we can’t change hearts if we’re scared out of our minds. We need the security forces to protect the people’s right to feel safe in their own country. Until then, we’re having talks with a gun pointed at our head. And that’s no way to negotiate. This entry was posted in Blogs and tagged extremism, imran khan, militancy, negotiations, PTI, taliban by Mahmood Adeel. Bookmark the permalink.